It’s not all about purrs anymore—it’s about plants! The crazy plant lady trend is growing as fast as unwanted weeds in the garden, with hashtags like #crazyplantlady, #iloveplants, #plantlife, and #plantgang garnering over 2 million tags. 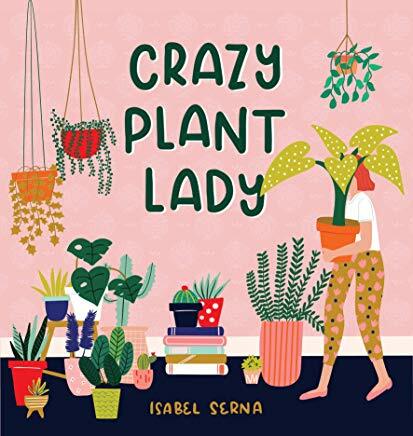 The obsession has spread to the gift market as well, appearing on cute accessories and household essentials, and now designer and plant enthusiast Isabel Serna brings plant love to life in her book Crazy Plant Lady. Ms. Serna is the founder of Black Lamb Studio, a Miami-based design studio with a focus on colorful patterns, fun stationary, and product design. She was formally trained as an industrial designer, and her work can be found on wallpaper, wrapping paper, textiles, stationary, and various printed media. She has collaborated with brands such as Kate Spade, Hallmark, Travelpro, Mixbook, West Elm, and Figo Fabrics. Isabel lives with her husband, her French bulldog, and many, many plants in Miami, Florida. Plus, it includes adorable plant stickers. Crazy Plant Lady makes the perfect Mother’s Day gift to say “aloe you very much” to all the plant moms in your life. This is an illustrated, humorous little book for the plant-obsessed woman of any age that celebrates the devotion and quirky habits plants inspire. Published by Workman.